Yesterday, we rescued a young orangutan from a community orchard. The Wildlife Rescue Unit (WRU) team was comprised of the Central Kalimantan Wildlife Department (BKSDA II) and Orangutan Foundation. The team searched for the orangutan and once located the orangutan was safely tranquillised and examined by our vet, Dr Dimas Yufrizar, who took blood samples for laboratory tests and gave injections of multivitamins. Read more on our blog. Image: Vet examining Paddington’s teeth. When we rescued Paddington, a Bornean sun bear, from being kept as a pet, he was thin and his canine teeth were missing. Orangutan Foundation staff at Camp Gemini, in Lamandau Wildlife Reserve, looked after him, giving him fruit and weathered logs, with termites in. After 18 months, Paddington’s canines came through and last week he was released back into the forest, where he belongs! A few days ago, Orangutan Foundation guard post staff responded quickly to extinguish fires inside Lamandau Wildlife Reserve. We work closely with local government agencies to prevent further fires occurring. Last week, Orangutan Foundation Founder & Director/Trustee, Ashley Leiman OBE, returned from Central Kalimantan, Indonesian Borneo, where she welcomed our new Indonesian Program Manager, Hendra Gunawan. In an action-pack schedule they visited all ten of Orangutan Foundation’s guard posts, five orangutan post-release monitoring camps and Pondok Ambung Tropical Forest Research Station. Connecting people with nature and teaching about its importance is crucial to the future survival of orangutans, forests and people. 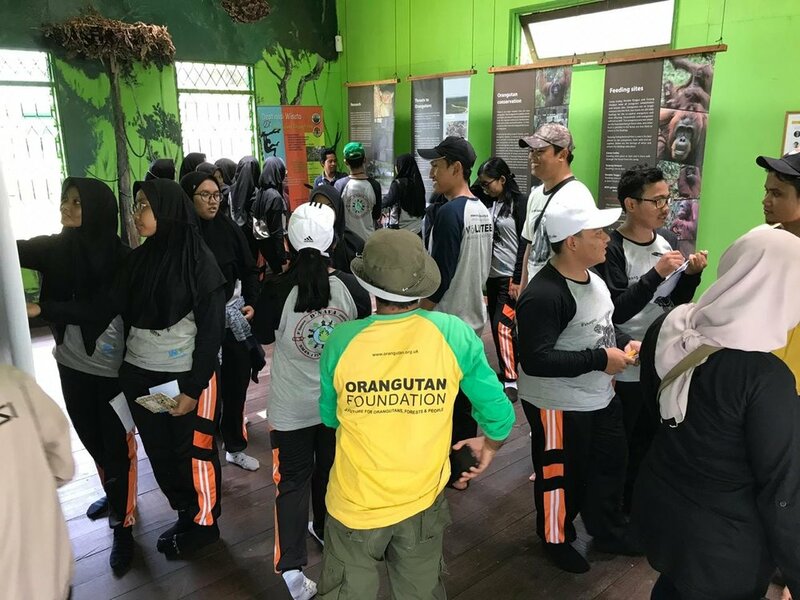 On 23-24th March, Orangutan Foundation and Tanjung Puting National Park welcomed a field trip from the local high school, SMAN 1 Pangkalan Bun. The students visited Tanjung Harapan Information Center (image above), a Medicinal Plant Demonstration Plot, Camp Leakey and stayed over night at Pondok Ambung Tropical Forest Research Station. We hope their experience will lead to many becoming stewards of Borneo's nature! Welcome to our February e-news bringing you news of our work to conserve the critically endangered orangutan and its forest habitat. Orangutan Foundation’s vet, Dr Dimas Yuzrifar and our Reintroduction Manager, Pak Azhari, visit our post-release orangutan monitoring camps, in the Lamandau Wildlife Reserve, Indonesian Borneo, on a weekly basis to check up on the orangutans. This month, they had an unexpected encounter… Read more on our blog. Young orphaned orangutans, Nyunyu (left) and Mona (right). Collaboration with our local partners is fundamental to the success of our conservation programmes in Central Kalimantan, Indonesian Borneo. 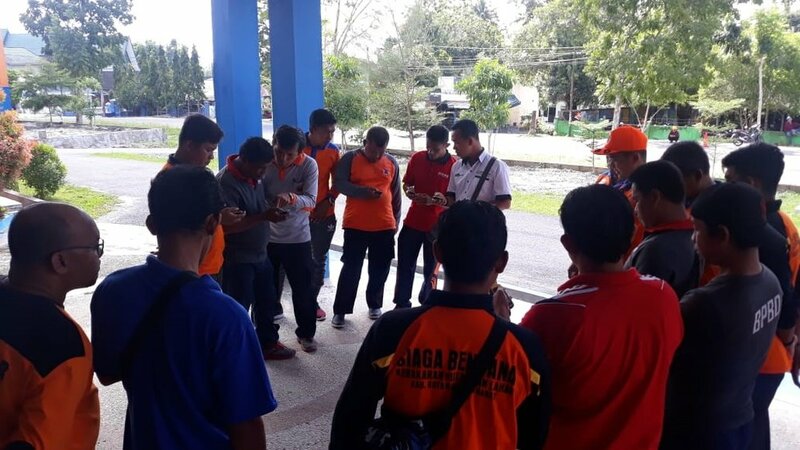 Orangutan Foundation were honoured to be asked to provide GPS training for the Indonesian Rapid Reaction Team of the Regional Disaster Management Agency, BPBD. In 2018, we worked closely with the Rapid Reaction Team to co-ordinate a response to tackle forest fires when helicopters were used to water bomb and prevent the spread of fires into the critical orangutan habitats of Tanjung Puting National Park and Lamandau Wildlife Reserve. Orangutan Foundation’s GIS Technician, Iqbal Tawakkal (middle, wearing white shirt) providing training for Rapid Reaction Team. Welcome to our January e-news bringing you news of our work to conserve the critically endangered orangutan and its forest habitat. Orangutan Foundation vet, Dr Dimas, has kept a close eye on the healing of Abid’s broken arm. 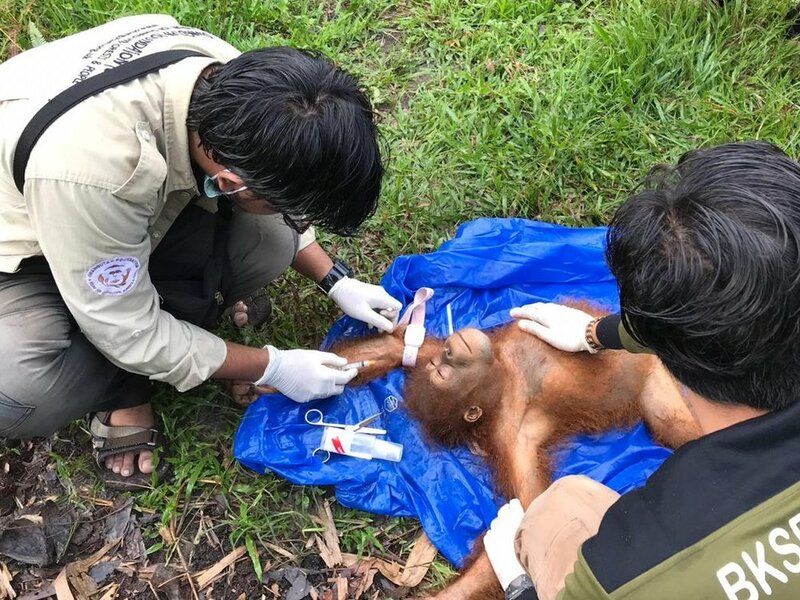 Two-year-old orangutan Adib fractured his arm on 16th December after he fell from a tree. Read more our blog. Our network of guard posts in Lamandau Wildlife Reserve and Tanjung Puting National Park are crucial in preventing illegal activities and deforestation. Staff patrol a 5km radius from the guard post. Conservation drones are used to monitor a much wider area. In the last two months only one case of illegal logging was detected. Maintaining this visible presence on the ground is essential to protecting orangutan habitat. Find our about agro-forestry by reading our blog below. In December and January, Orangutan Foundation welcomed the involvement of local high school students from Pangkalan Bun. In partnership with Tanjung Puting National Park we hosted and ran a series of activities for 70 students at Pondok Ambung Tropical Forest Research Station. Students from Gadjah Mada University travelled to one of our guard posts in the South of the park to learn about peat swamp forests and wildlife monitoring and survey techniques. Thank you for your continued support of our work towards a future for orangutans, forests and people.